This is a very odd curio of an album. 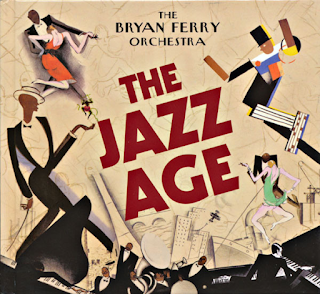 Although titled "The Bryan Ferry Orchestra", Ferry himself doesn't feature on it at all. It is a collection of Ferry's solo material and Roxy Music numbers played by Ferry's regular backing musicians from the time, in a 1920s ragtime-ish jazz style. There are no vocals on the album at all, and, what makes it a flawed album, for me, is that the music is played in a deliberately "lo-fi", muffled mono sound. This is done, presumably, to add a 1920s authenticity to it, rather like some artists have added scratches to songs to make them sound like old blues numbers. Personally, I would preferred it if they had applied contemporary, decent sound to the music. It is a nice concept, but I feel it could have been so much better. As for the music itself, most of the tracks are barely recognisable as the songs they once were. Roxy Music's "Just Like You" is one of the only ones that does sound like it used to. Others, like "Love Is The Drug" and "Don't Stop The Dance" have hints, here and there. Some, like "Do The Strand" and "This Is Tomorrow" have me struggling to find any musical link. No doubt, there are lots of musical elements in there, to a trained ear, but to my philistine ear they sound like different melodies. I dig this out and give it a play around once a year, but every time I do, it leaves me frustrated. I guess that will never change. I love the cover though.